The Funzi and Bodo Trust has a medical clinic in each village open seven days a week. The Funzi and Bodo Trust has built a physiotherapy centre. It provides disabled children and adults, people who are injured or those with delayed learning the chance of a full life. Children who have been unable to walk or use limbs have regained mobility as a result of this work with trained professionals. When emergencies happen the Funzi and Bodo Trust has a road and a water “ambulance” to reach hospital. This has saved many lives when people have become extremely ill but especially among pregnant women when labour complications have occurred. The Funzi and Bodo Trust has built over 170 toilets as no homes in either village had any. Now every family has a dedicated toilet. The toilets have solar lighting and facilities to wash hands. Soap is manufactured by local seaweed farmers who started their business with help from the Trust. These toilets reduces the spread of potentially fatal illnesses which have claimed many lives in the villages in past. The clinics in Bodo and on Funzi Island also provide ante and post-natal care for mothers and growth monitoring and immunisation services for babies. The clinics provides health education and contraceptive services. They are closely connected to the nearest hospital which provides training for our nurses and monitors our records. Bodo also has a laboratory which gives instant diagnosis of illnesses which threaten lives like malaria or cholera. It also does HIV testing and tests for diabetes among other conditions. The charity supports children and adults with long term and life threatening illnesses. These include cancers, TB and sickle cell disease. Terminally ill patients are also helped with palliative care. The Funzi and Bodo Trust funds operations people cannot afford to pay for. Past examples have included three major heart operations on children, the removal of tumours and hernias. Partnerships with other charities mean it can provide services like eye care. This has included cataract treatments for the elderly and the provision of glasses. The Funzi and Bodo Trust has built schools, libraries and a computer training centre to replace crumbling and dangerous buildings. Kindergartens were built at both sites and for the first time every child attending school was guaranteed a desk and access to toilets and hand washing facilities. Two libraries holding thousands of books were opened in the schools which previously had nothing, alongside a computer suite with 15 computers was opened offering classes to both children and adults. High school is too expensive for most village children. Each year the Funzi and Bodo Trust offers vocational courses leading to qualifications and employment for young people who cannot afford a high school education. The Funzi and Bodo Trust has a chicken farm – soon to number over 5000 birds - which provides eggs to improve the health of badly nourished children and offers agricultural training opportunities for parents and children. The school in Funzi has one of many giant water tanks built by the charity. These collects rain water for drinking. Water on Funzi island is dangerously salty and this caused major health problems in the past. The charity has also provided pumps and wells elsewhere on the island. The Trust offers prizes to school children encouraging educational achievement and effort at both schools. Every child has a desk. Before the Trust was formed children sat on mud floors. 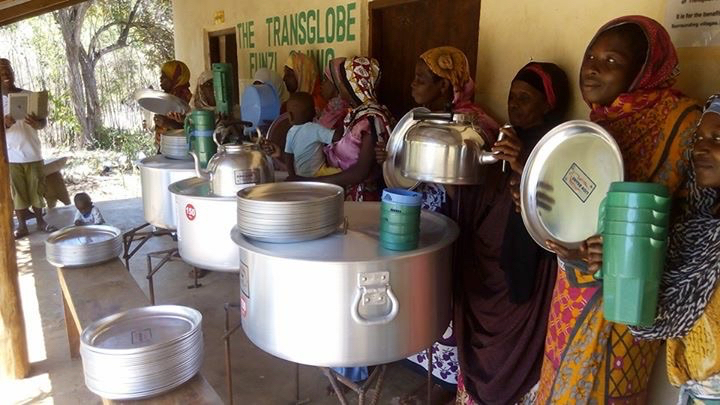 We provide small loans to women’s groups (these can include men) to start businesses. These new businesses like seaweed farming, catering and fish farming provide incomes ensuring families are fed and they can support themselves. They begin to break the cycle of poverty and encourage people to take part in local loan and banking schemes. New loans are made every year and more and more businesses are starting. The Trust has training bursaries for young people unable to afford secondary education so they can receive vocational training and qualifications leading to employment. The Trust’s five thousand strong chicken farming project is providing skills training in agriculture and small scale farming. The eggs from the birds provide nutrition for poorly nourished school children and their sales generate funds to buy medicines. Our activities – like the clinics - bring people to our villages where they spend money with local businesses like street cafes, at vegetable stalls selling locally grown food and they buy fish from local fishermen. This boosts the local economy, provides incomes and helps families become self sufficient. We have advanced plans for a market place on Funzi Island, it will allow people to sell more effectively to tourists and to each other. This centre will include a small bank, an adult library, refrigeration, a café and a space for education and teaching. Tourism to the wildlife rich island of Funzi is popular and the Trust is working towards making it a more significant destination for visitors to bring more income and business to the island.